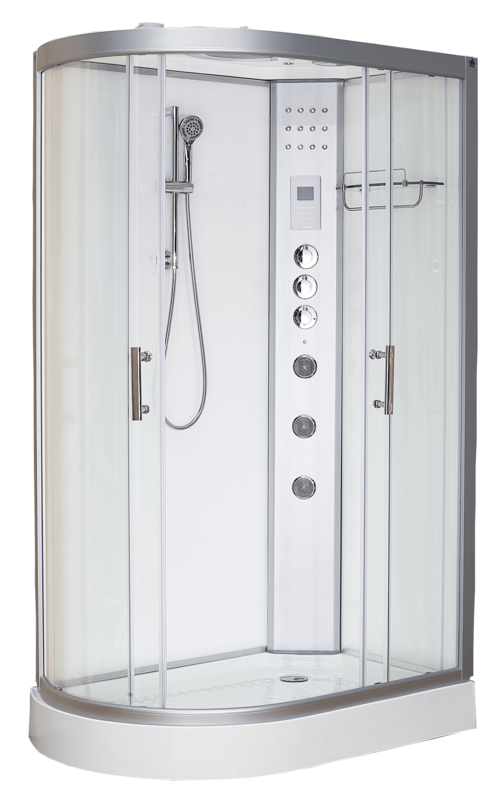 With the exception of Vidalux Electric Shower Enclosures and Kubex Shower Pods, all other models shown here require a pressurised hot and cold water supply between 2 & 3 bar and a flow rate of 7.5 litres per minute on each. Combi boiler systems & Megaflows are both fine with these types of showers units; the gravity-fed style of boiler will require a pump though. 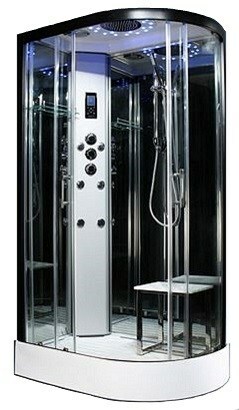 If a shower features interior lighting, FM radio and fan etc., then a fused 13amp power supply will also be required. Do please see our Ultimate Buyers Guide for more details on this topic. To View Other Showert Cabin Model Types Please Click The Quick Access Buttons Below Or The Full Menu Navigation Above At The Top Of The Page. Shown directly below first, are our "open at the top" shower cabins ranging from 800mm x 800mm up to 1000mm x 1000mm quadrant models, which are ​low-step tray profiles, for corner fitting. Interior finishes range from tinted mirror glass, to either white or black glass. 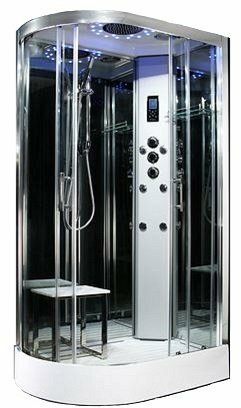 Larger models in other shapes & fully enclosed shower cabins are further down this page and ​include 900mm x 900mm, 1100mm x 700mm and 1200mm x 800mm. 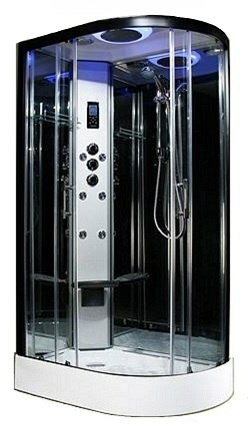 Nearly all the shower cabinets and pods featured on this page, come with an overhead monsoon shower, hand riser shower and back jets as standard showering functions. 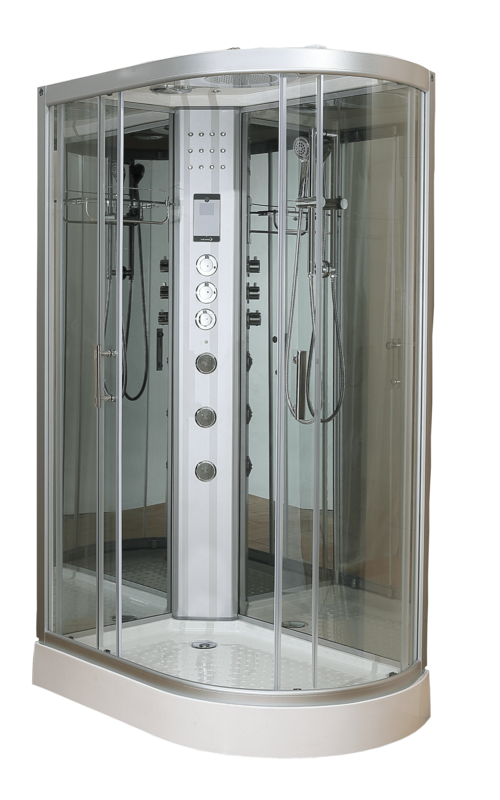 Some models are open at the top and others are fully enclosed; there are mixer type and thermostatically controlled valves and one range of shower pods, can be fitted with an electric shower of your choice, if required. 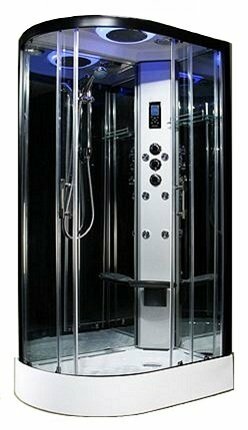 The new Insignia 2nd Generation Showers, provide plenty of scope for customers seeking multiple design options. 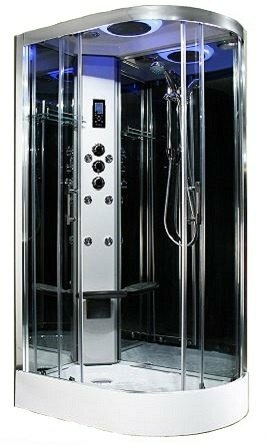 If in addition to the main shower features, you'd like to have the benefit of a steam function too, then please see our Steam Showers range. 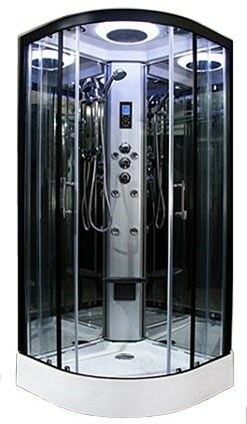 For something rather special - perhaps with a bath and whirlpool feature, plus the steam function, check out ​the Whirlpool Bath Showers. 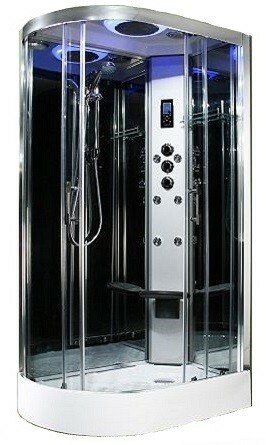 To create your very own combo steam room and shower in the bathroom, please see the Insignia Steam Room Kits. 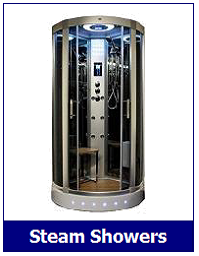 "Our shower bath replacement options at prices to suit all budgets..."
Our shower cabins UK brands, offer varied choice and excellent value....."
Large corner shower cabins...open top. "Self contained shower cubicle with roofs are another great option...."
In this section, we're showing the fully enclosed, shower cabin range with popular sizes of 800mm x 800mm and 900mm x 900mm up to 1000mm x 1000m. These models all have roof panels that house the overhead shower and extractor fan, plus the speaker if the model is fitted with FM radio. All are low-step quadrant tray profiles, for fitting into a corner. 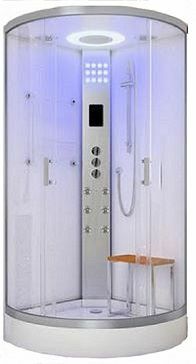 There are choices of interior finish on the shower cabins, ranging from white acrylic and tinted mirror glass, to either white or black glass plus all are self contained and free standing models. 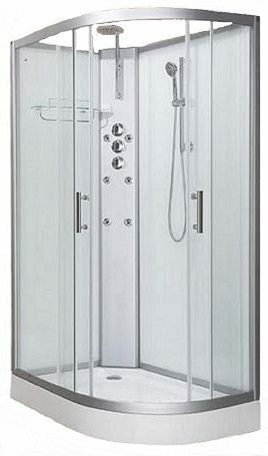 "Shower cubicles in various sizes and profile shapes...."
"Free standing shower pods in various shapes and sizes......"
Complete shower units that are offset for more space...."
Introduced below, are the "open at the top" elongated or offset shower cabin range which by default, are all designed to fit into a corner of the room. 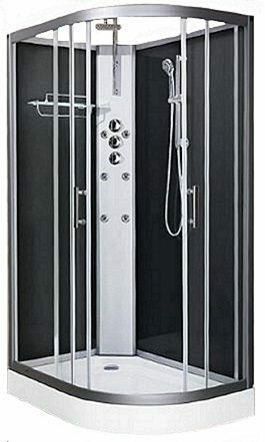 These complete showers are longer down one side and thus provide more interior space and are available in either Left or Right handed units. The predominant size is 1200mm x 800mm and the interior finish ranges from white acrylic and tinted mirror glass, to either white or black glass. 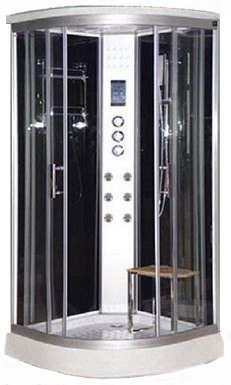 Our shower enclosures UK brands, offer great value and superb choice....."
In this section are the fully enclosed, elongated or off-set shower cabin range which by default, are all designed to fit into a corner of the room. These showers are longer down one side and thus provide more interior space and are available in either Left or Right handed option. All have roof panels that house the overhead shower plus the speaker if the model is fitted with FM radio. Low-step quadrant tray profiles are the norm, for fitting into a corner. 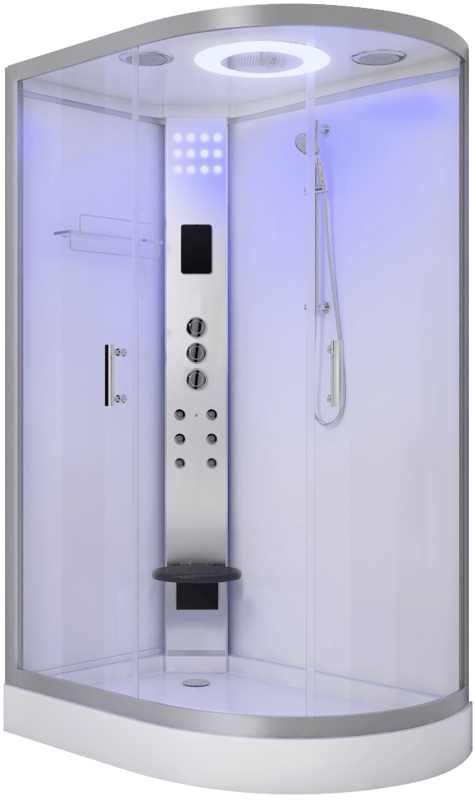 "Shower cabinets UK, the electric shower cabin solution...."
Kubex....simply add your choice of electric shower or shower valve! Two ranges in small sizes, ready made to fit through any 2ft 6in doorway. Third range flat packed with fast assembly and all with a unique leak-free design. Made in the UK. 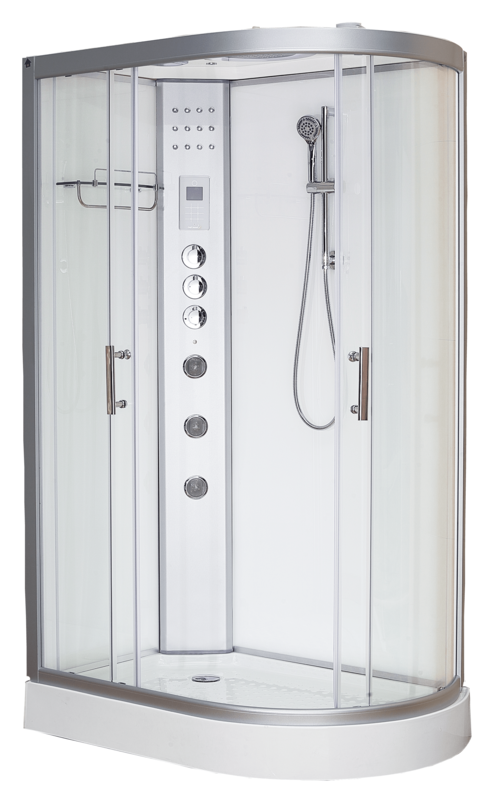 "Shower cabinets by Kubex with your choice of entry style...."
New developments with our shower cabins offer this month, are the recent introduction of the Pure E range from Vidalux. 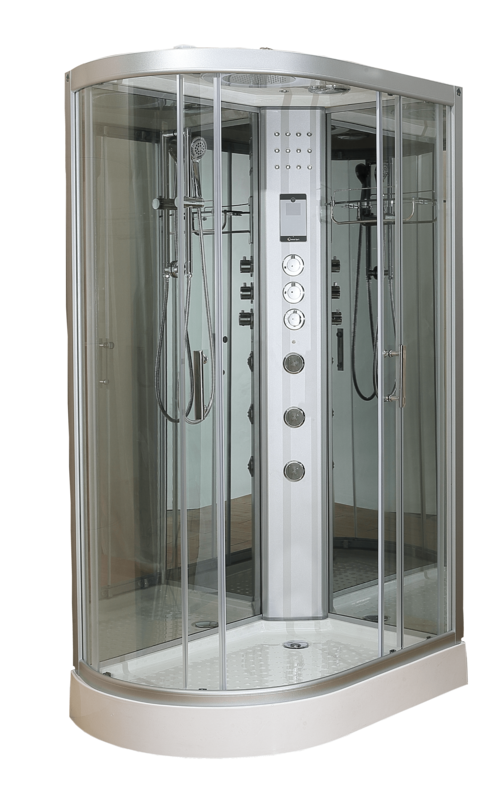 Based upon their already popular Pure valve models, the Pure E provides various options in providing customers with an electric shower cabin. 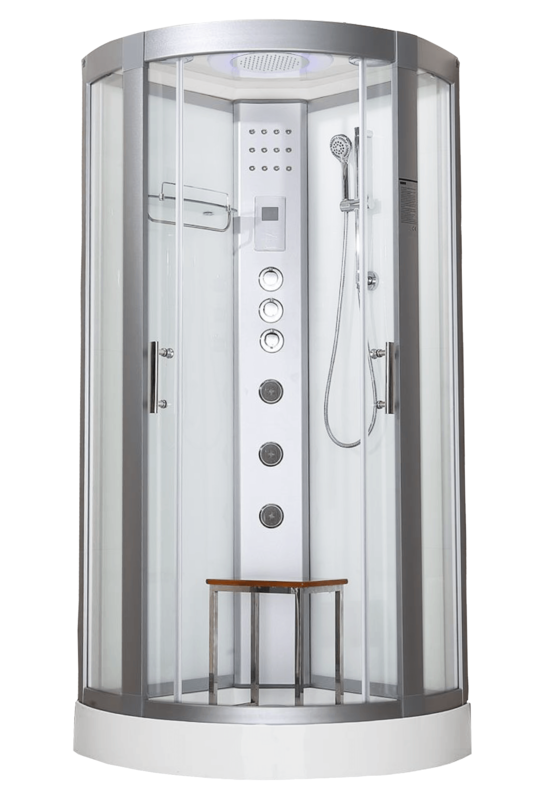 Although we've promoted the Kubex shower pods for some time that can have an electric unit fitted, the Pure E presents much more scope for those with only a cold water supply. Large shower cabins and small shower cabin models are available in corner fitting sizes of 800mm x 800mm, 900mm x 900mm and 1000mm x 1000mm are the quadrant shaped models, with more spacious elongated shower cubicle measuring 1200mm x 800mm that comes in either a Left or Right hand style. 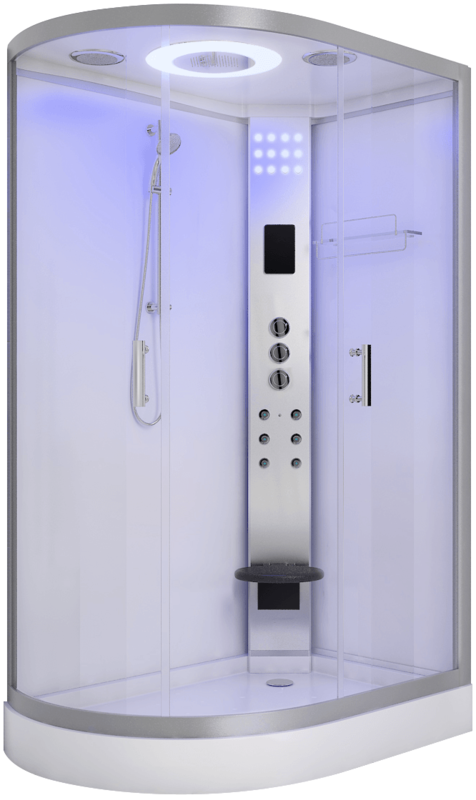 The great news if you already have your own electric shower unit, is that with Pure E you can purchase a blank or empty shower cubicle and simply fit your own - provided it's no more than 19cm in width. Additionally, there are 6 Triton electric shower unit options for each Pure E model, so flexibility is certainly the key here from Vidalux. 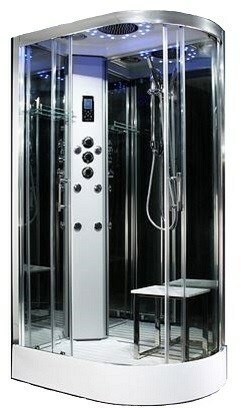 Check out the Pure E Electric Shower Cabins here. 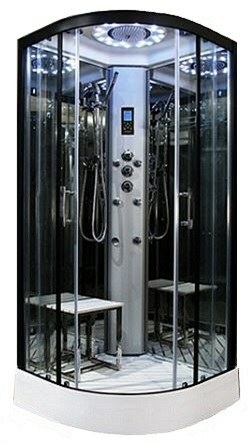 What are the shower cabins sizes and shapes? 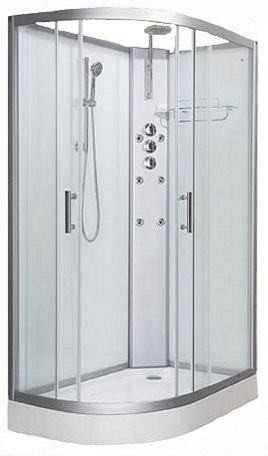 Shower cabins and cubicles are made in a several different sizes and the more standard ones are shown below. Shapes include quadrant or corner, offset - also known as elongated, plus rectangular and square. The sizes shown are in mm millimeters and are the dimensions of the shower tray. As a further guide, if you draw that dimension on the floor as a square or rectangle, the the fully assembled shower, will fit that space. 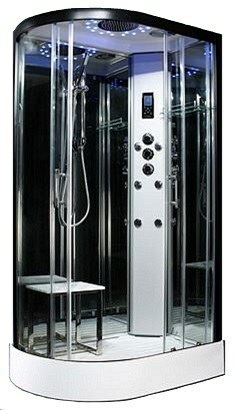 The overall heights of the shower cabins can vary, although 2200mm to 2300mm is the average across brands. Cabin, cubicle, pod....what's the difference? 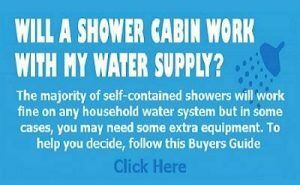 Purchasing Advice For Shower Cabins. 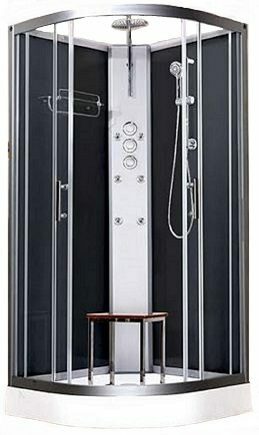 The buying of a shower cabin or cubicle is without doubt a substantial purchase for most people and with the large and growing volume of models, brands, suppliers and offers available online these days, those historic wise words of "getting what one pays for" is certainly applicable in this context. 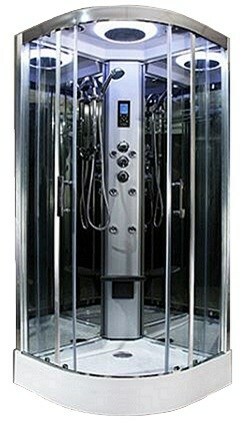 This not just in terms of the quality in the shower cabins supplied, but also the degree of reliability, customer service, pre and post sales support and the availability of replacement spare parts, should there be a problem with the shower cubicle in the future. Although the price to be paid will be a major factor for many customers, all those other important elements should also be duly considered to ensure the best ovveral deal is secured, with regards to cost and in terms of product value and service. 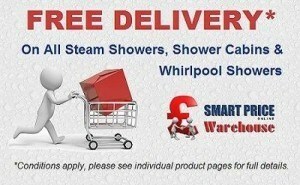 Cheap shower cabins and cubicles is not something we sell here at Smart Price. 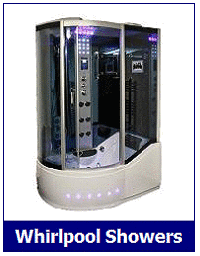 However, what we are able to supply is top quality self-contained shower cabins at very competitive prices that are priced low based on high volume manufacturing, but without cutting corners on end product quality. 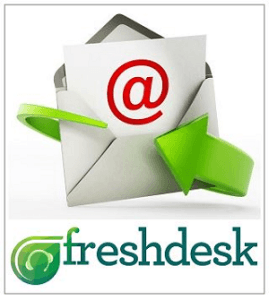 Furthermore, us and our brand partners are likely among the largest and more successful suppliers and re-sellers in the UK with in excess of 12 years of specific experience within this product sector. 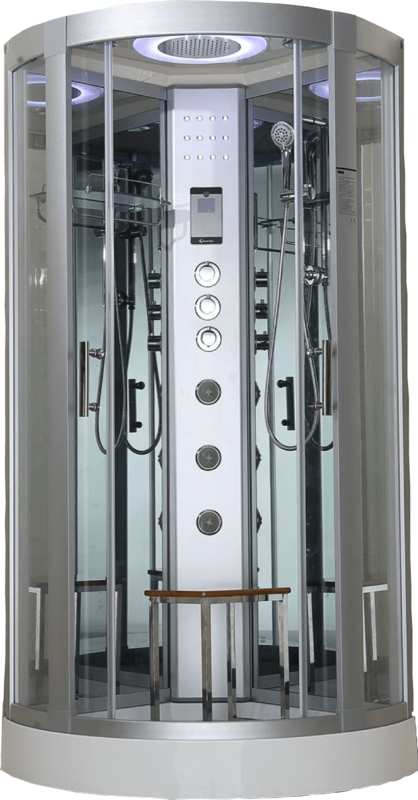 On an initial review, a shower cabin seen online may appear to be great value but do check the following is provided along with the purchase: a) Quality product with a good specification - see our manufacturing guide further down this article. b) Installation and Operational Guides for shower cabins provided c) A technical support Help Line number for direct advice regarding installations. 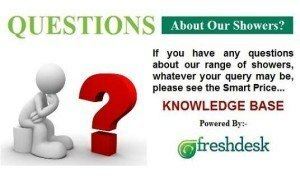 d) After sales service provided e) The Warranty duration and terms f) The availability of replacement spare parts post warranty period. 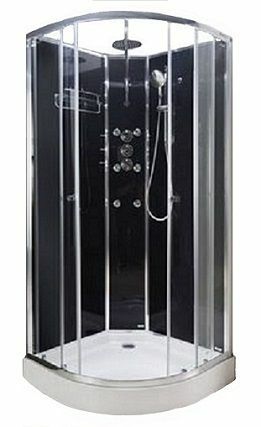 Shower Glass:- The shower cabin, cubicle and enclosure models are compliant with ISO9001, CE and fitted with safetly glass. This between 5mm and 6mm and subjected to safety tests to ensure in circumstances where if the glass should break, that this will fragment into very small pieces, free of any sharp edges. 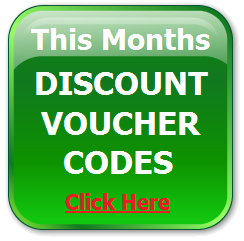 Unless specified otherwise, this will apply to glass doors, front panels and rear panels if applicable. 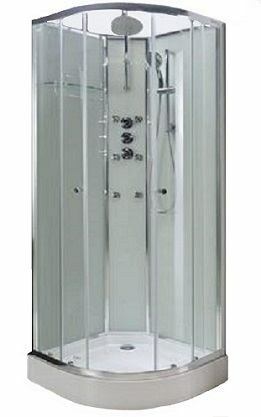 Shower Frames:- In general, the outer frames on shower cabins and cubicles are manufactured in 1.2mm aluminium unless otherwise stated. This provides good stability and structural support and finishes can include polished or powder coated silver, black etc. 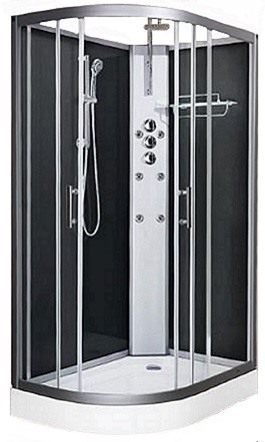 On cheap shower cabins of inferior quality, check for frames made of plastic that have been paint sprayed to give the outwards appearance of aluminium as these are not as long lasting or sturdy. 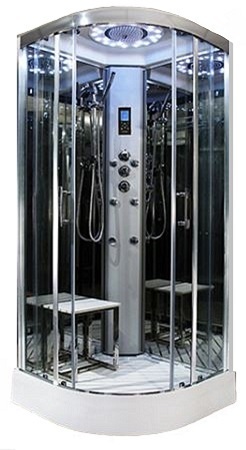 Shower Trays:- The trays on most free-standing shower cabins are made from reinforced acrylic and should be further strengthened and supported by a steel frame underneath that is bonded to the tray and also incorporates adjustable feet for leveling purposes. Excluding ultra low tray versions, a shower tray base that is not supported on a steel frame can cause flexing and cracking plus the unbalancing of the occupant during use. Most trays come in a standard white finish and a good number of manufactures, can also supply an optional slatted floor insert that can be lifted in and out for cleaning purposes. 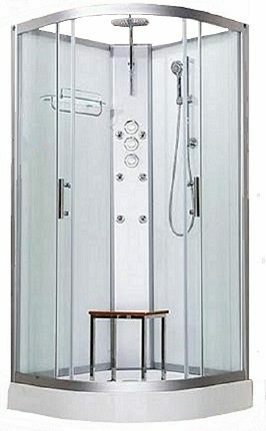 Shower Connections:- Shower cabins and cubicles require one hot and one cold supply, a waste outlet and if the unit has lights and FM radio etc; a 13amp power supply will also be needed. On units supplied through us, connections are behind the control tower - either in the corner on quadrant shower cabins or in the centre on rectangular models. Most suppliers include long 15mm flexible connectors for the hot and cold supply and a flexible waste pipe. 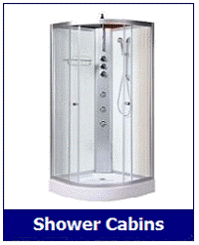 When one first commences searching the web for a shower cabin or cubicle to purchase, it soon becomes apparent just how many suppliers and resources there are. These can likely include Insignia Outlet and Steam Shower Store, JTSpas and Victorian Plumbing to mention but a few. The next realisation, is that many seem to sell at least some of the same enclosures and cabins which is also true. Now whilst the number of years trading online; reviews and feedback, plus service and support are all in our view, key factors in making your choice of where to buy, for many purchasers it is still the price to be paid, that is the main deciding factor. 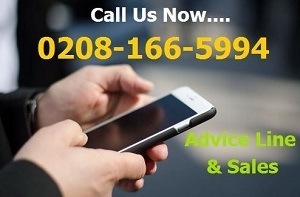 So whether you've reviewed those retailers noted above or other outlets such as Better Bathrooms and Heat & Plumb, Rubber Duck or Victoria Plum....ALWAYS contact us, Smart Price Warehouse on 0208-166-5994 for our BEST price of the day and also check our Discount Code Page too.